Professional translation English to French can sometimes cause confusion. For many people, the terms ‘translator’ and ‘interpreter’ are interchangeable, but these are, in fact, entirely different professions and services. How is it possible for you know the difference between the two, and which one you need for your project? The first – and most important – point of difference between a language translator and an interpreter is the work that they are asked to do. Translators work with the written word, whereas interpreters deal with the spoken word. So, translators work with things such as academic papers, web pages, novels, speeches, and contracts. They will translate English to French and vice versa, as well as many other languages, depending on their speciality. A translator most often works alone, but an interpreter, due to the nature of the work, will usually work with other people. This could be either directly or virtually. Each type of work is approached differently as well. Translation work can take many days, even weeks or months, depending on how long the original document or text is. Interpretation work is usually immediate, and carried out in real time. 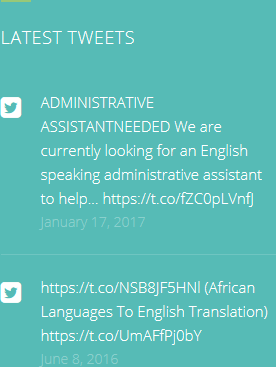 A translator can therefore look ahead in their work schedule and give you a firm date. This can be extremely important if you have an important deadline coming up. When you book your translator, you should discuss with them how long the project is going to take. They will be able to give you at least a good guess, and usually an accurate end date. 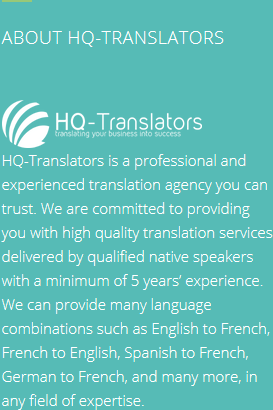 With a worldwide team of established professional translation English to French specialists, HQ-Translators is the best place for you. 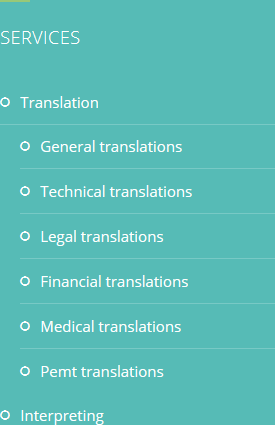 Find out more about our extensive range of services at https://hq-translators.com. Contact us on (00 237) 242 71 38 38, or (00 237) 693 21 69 27, or you can email infos@hq-translators.com for more information.